Writing a resume or CV today can be frustrating and time consuming, especially for those who are out of practice or starting from scratch. As our tongue-in-cheek title suggests, it is easy to stumble in this area. We have seen brilliant marketers and salespeople struggle for days to put together a 1 or 2-page sheet of their own career experiences and qualifications, which is essentially about selling themselves. They are not alone. There are literally thousands of articles and tip sheets on how to write a resume and more are written every day. Our goal here is to give you a recruiter’s perspective on resume writing, which has changed quite a bit from the old career objective to experience to education model of 20 years ago. A resume has one primary purpose: to highlight your qualifications and experiences enough to get you an interview and begin the process of getting your next position. Thus, your resume needs to be focused, clear, consistent and impactful. It also needs to be true and real. Who could forget Darryl the Paper Warehouse Foreman on the TV show “The Office,” when he put on his resume, “Coordinated and implemented receipt, storage and delivery of 2.5 billion units of inventory.” When questioned about what the units were, his sheepish response was, “pieces of paper.” Hilarious, but also an example of what not to do on resumes. For most recruiters today, candidate resumes are “parsed,” meaning imported into an ATS (Applicant Tracking System) which extracts the key data in a way that makes sense to them and allows for better organization and matching to an open position. Thus, resumes today need to be more keyword-driven and focused on qualifications and behaviors that align to the position that is being sought. There is no longer a need for that opening “Objective” paragraph (we know what your objective is—to get the job), nor is there need for descriptive detail about the company you used to work at (that can be easily found online). Resumes today need to be less about your responsibilities, and more about the impact you made. 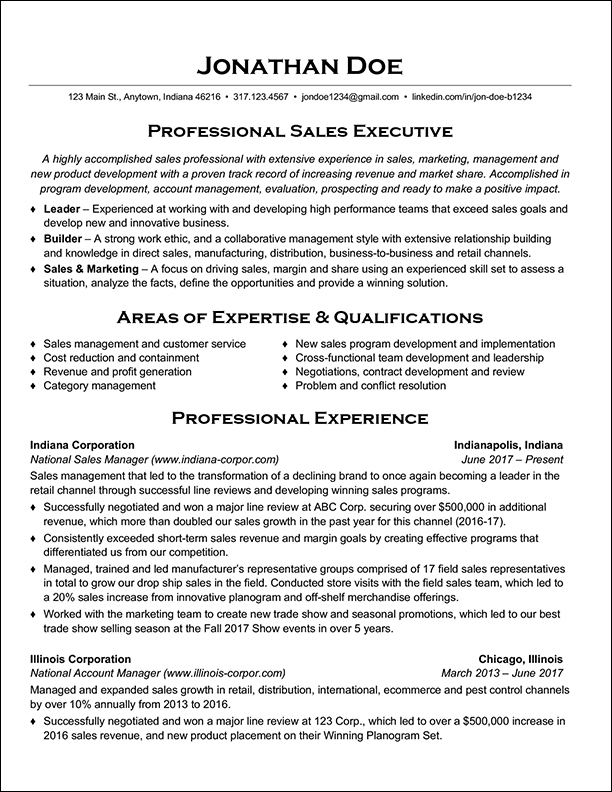 THE “BEFORE” RESUME: Typical resume prior to applying our chronological resume layout (Click on the resume to expand). There are two types of resumes that we typically come across: chronological and functional. A chronological resume is the typical “chronological” order of experiences that build on each other and is consistent with a candidate seeking a position in their current field. A functional resume is a great choice for those seeking a career change and focuses more on demonstrating the knowledge, skills and abilities of those wishing to access different channels. 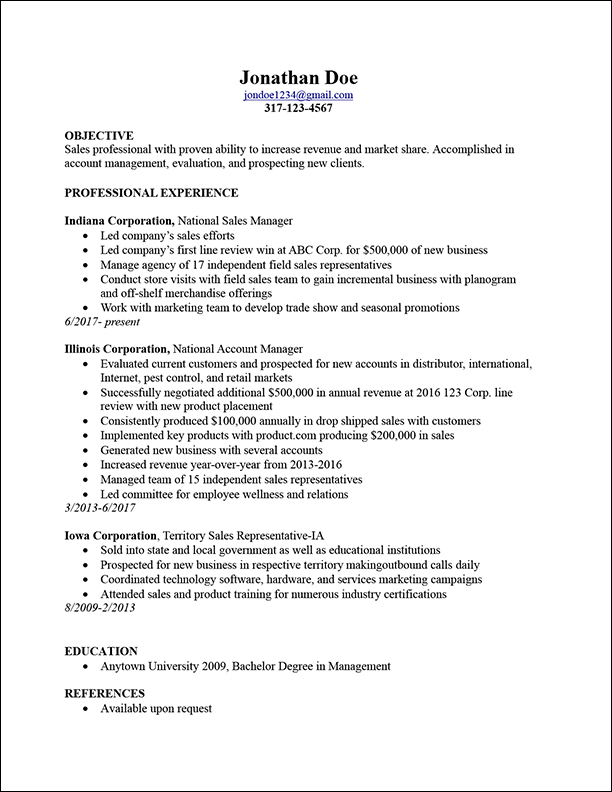 For our purposes, we will focus on chronological resumes since they are the most common. Font and Size: We recommend a clear sans-serif type face that can be easily read and parsed (for example, Arial, Calibri or Helvetica). A good rule of thumb on font size is 10-11 pt. Possibly 9 pt. for a larger resume and 12 pt. for a smaller one. For your name and section headlines you may want to employ a serif font (for example, Times New Roman). Keep your font and sizing consistent throughout the document. Heading and Address Information: The heading is your name. Then follow it on the next line with your home address (city and state only is fine), mobile number, personal email address (not your work email) and a link to your LinkedIn profile (especially if you have a more common name). LinkedIn is a tremendous tool used by most recruiters, and it should also reflect the key parts of your resume. Profile: If you are a Director of IT that manages people, then your profile headline should read, “Professional IT Executive & Business Leader” (Note that we said “leader” and not manager). Then follow with (3) bullets that focus on what the prospective recruiter or employer is seeking for the position and how you would be a fit. NOTE: This section is about what you will contribute to the company, not your personal objective. Save that for the interview. Summary of Qualifications: Though often considered optional, we like to see this section because this where you can really focus on keywords. State in bullet-point form the abilities, skills and the qualifications that would make you ideal for the position. Skills: If the position you are applying to requires necessary skills (for example, proficiency in MS Office and CRM programs or various other software programs), then include this section. However, for many sales and middle to upper management positions, these skills may be commonplace and, therefore, not necessary to include since they are assumed. THE “AFTER” RESUME: After applying our new chronological resume layout (Click on the resume to expand). Education: Simply list degrees earned with the latest being first. For those new to the workforce, more detail here (for example, GPA, Dean’s List and Awards) will be necessary because you have more education than experience. For those who have more experience, then simply state the school, location, degree earned. High school is not necessary. Continuing Education, Professional Designations and/or Certifications: Important to show any certifications, especially if critical to the position, and that you’re a continual learner. Awards & Accomplishments: Recognition for your achievements is always important and your resume is not a place for you to be modest. This section can often make a big difference if two candidates are similar in qualifications and skillset. Volunteer Work: Many recruiters and employers will say this section is not that important and we disagree. Be it volunteer work in your community, school or church, we find this to say a lot about a candidate’s character and helpful in assessing a candidate’s honesty, integrity and giving nature. We also recommend you take the time to research resumes and review examples. There are hundreds of thousands of examples and templates online and many are targeted for the position you are seeking. These samples will provide you with a good guideline of what type of information to include. Also, and this is very important, do not submit a Word file of your resume because you never know what it is going to look like on the other end. All key word processing programs (especially MS Word) have the ability to create a PDF. Most resume parsers can easily read a PDF and what you see is typically what will show up on the other end. It would be tragic for all the hard work that you did on a Mac to then have all your tabs blown out and layout ruined on a PC running a different version or not having the font you used. Does your Resume have GAME? Why is this so important in this age of texting? Because on the recruiting and hiring side it is the easiest way to eliminate a candidate from contention. This also speaks to laziness. If a candidate did not put the time and effort into a document that is intended to give someone the best impression of them to get an interview, then how will they perform on the job itself? What does this say about the candidate’s attention to detail and the importance of accuracy? Spelling and grammar checking, and having your resume proofed by a friend or colleague are easy. Type consistency and making sure the layout looks good and tabs are lined up are critical. What are you proud of? This is not the time to be shy or modest or assume that the potential employer doesn’t want to see your accolades because they do! It also often makes the difference. Achievements and awards show that you have the credentials and bona fides to not only meet the requirements of the position, but to exceed them. When we talk to candidates, we will often ask this question: do you have any awards or accomplishments that you are particularly proud of? Typically, the candidate will beam with pride as he/she talks about an award he/she won, but it is nowhere to be found on their resume. One of the most glaring examples of poorly written resumes today is a lack of metrics. Recruiters and employers want to see not just what you did, but the degree to which you did it. These are typically a number expressed with a number, “$” or “%” and can relate to sales growth, market share, expense reduction or any number of key performance indicators that would be important to the position. Some roles or responsibilities do not have numerically quantifiable metrics. In that case the result should be expressed as whatever impact or change that you did make – improved engagement, decreased errors, or other such changes. Numerical values are more impactful, but not always available. Include them when you can, but don’t choose to skip an important contribution you made to the business just because there are no metrics available, especially if the accomplishment pertains to the role you are seeking. We recently received a resume that had one bullet point under the job of “Regional Sales Manager.” The bullet point stated, “Managed 12 sales associates in 3 western states.” To make matters worse, the candidate had this position for 8 years. We asked, “Did you grow the business during this time frame?” “Yes,” he replied, “we had year-over-year increases of over 8% even during the last recession.” That’s great—you now have one bullet point. How about 3-4 more? After all, he had been in the position for 8 years. What is more important: the details of what you did, or the impact you made doing them? How did you grow the business? This speaks to many behaviors. If I am a hiring manager looking for a new Sales Manager to drive my business, the fact you managed 12 people in a span of 8 years means nothing. The fact that you grew the business or instituted a new strategy that led to an increase in sales or led to a reduction of expenses, means so much more. Many candidates are also worried about the confidentiality of the numbers. If you are concerned, then state the increases as percentages. You own your achievements, not your old company. This is your career history and one of the most important parts of a resume. This is where you tell a potential employer where you worked, when and what the responsibilities of the position were that would align to the new position. It should be set in order from your most recent position to your first. For each position, include the company name, location, title and dates you held the position (be sure to include month and year, and be prepared to logically explain any gaps). Also—speak in the present tense for your current job and past tense for your former positions. Then bullet point your accomplishments for each role. There are no hard and fast rules for resumes, but there are minimum guidelines of what is expected as well as a degree of salesmanship. Ask yourself this question when reviewing your resume: Does it have GAME? SOURCE: “Search Committee” The Office, written by Paul Lieberstein, directed by Jeffrey Blitz, 2011.